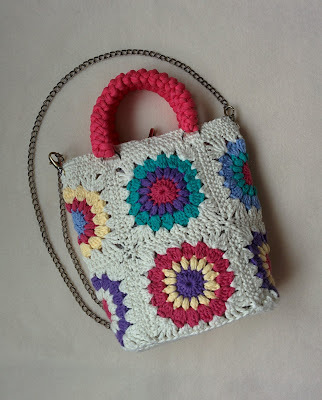 Love, love this pattern by Daisy Farm Crafts! It was amazing to see the pattern develop as one color moved to the next. Check out the video on the page to see how easy it is to make. 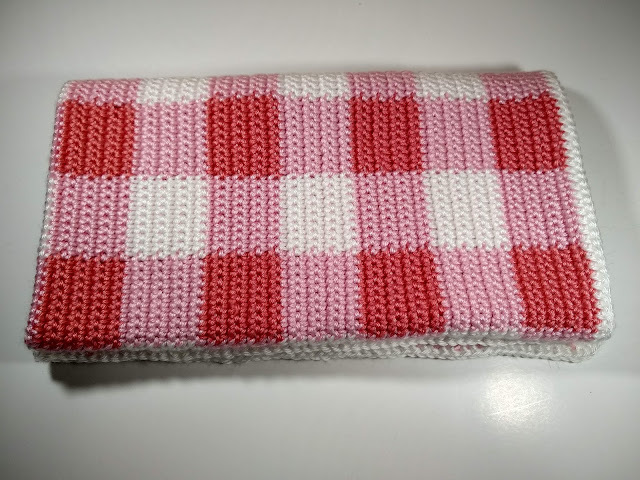 I used Daisy Farm's recommendation of Caron Simply Soft in white, soft pink, and strawberry. Basket bags are everywhere this spring. 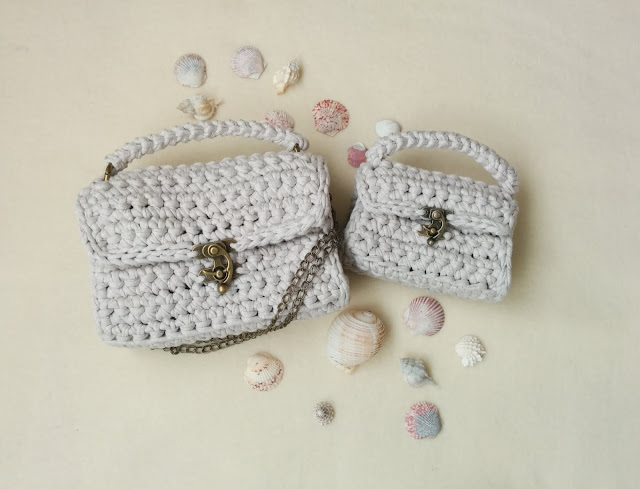 These bags look great with a pretty dress or with jeans. 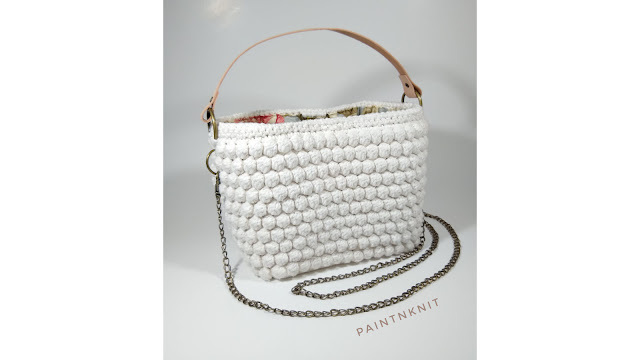 The bobble stitch along with the plastic canvas insert makes for a stand-up bag. Leather and metal accents add interest and boho vibe. Working with the leather opens up a whole new hobby that has so many possibilities. The veg tan strips make nice straps. Some strips are rougher on the reverse side than others. I rubbed the rough side of the leather with Gum Tragacanth which made the surface quite smooth. Also I picked up a leather punch drive set, rivets, and rivet setter set at a Tandy Leather Shop. 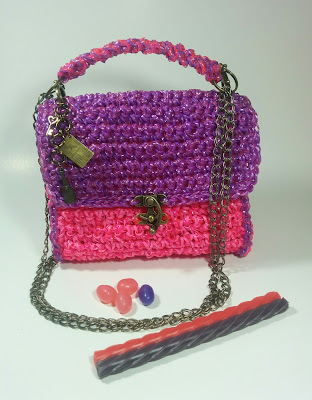 These items were not expensive and will give new options for bag making. 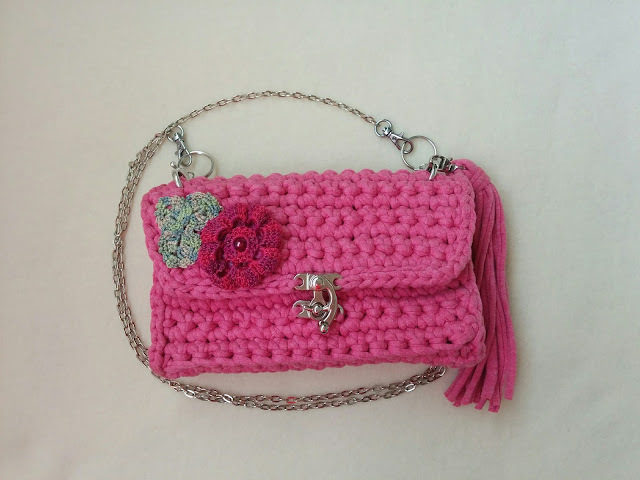 This videos takes you through the construction of the bag after the crocheting was complete. Enjoy and please let me know if you have any questions. These little bags were calling for something extra. So I crocheted roses with leaves using DMC size 5 Pearl thread. 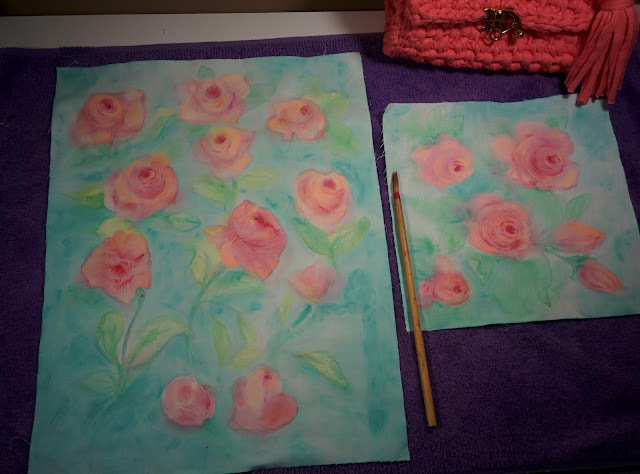 To stabilize the motif, I sewed the flower and leaves onto plastic canvas which was easy to attach to the purse by sewing through all thicknesses with invisible thread. This yarn was another goodie from the Hoooked eBay purchase. 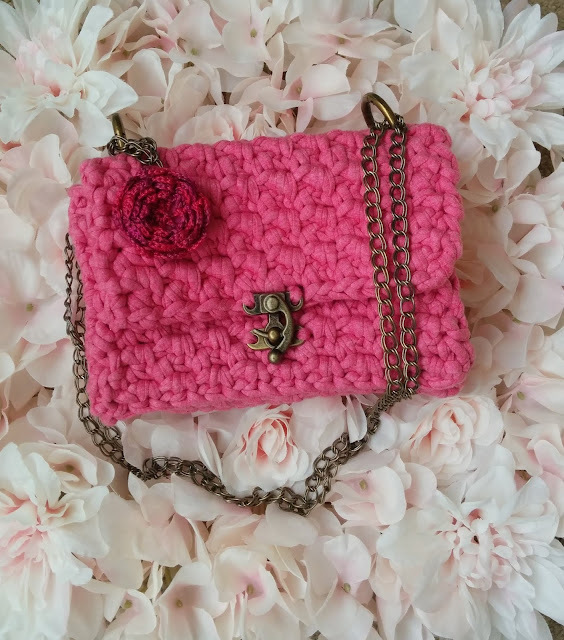 An Irish Crochet 🌹 provides a nice accent. Later you will see this purse with leaves also. I repeated the pattern twice and then began the decreases on a magic loop. Hats made with Caron Simply SoftSince double strands of Caron Simply Soft is still not chunky (5), which is needed for this pattern, I needed to improvise. Size 13 needles gave me too loose of a fabric, so I took the needle size down to size 10 (lavender and mauve hats). I used size 11 for the red/black hat, but prefer size 10. In order to use size 10, I needed to add a cable pattern of 14 stitches. In the end to get a roomy hat (mauve hat with Christmas ornament), I added 2 cables, casting on 76 stitches and increasing to 112. 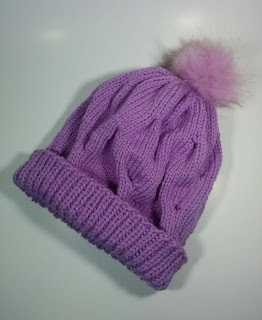 The hat above was knitted with Patons Roving Wool. I love this yarn! It is 100% wool and is so soft. I modified the pattern by casting 70 stitches onto 10 1/2 needles and increasing to 98 stitches making 7 cables. 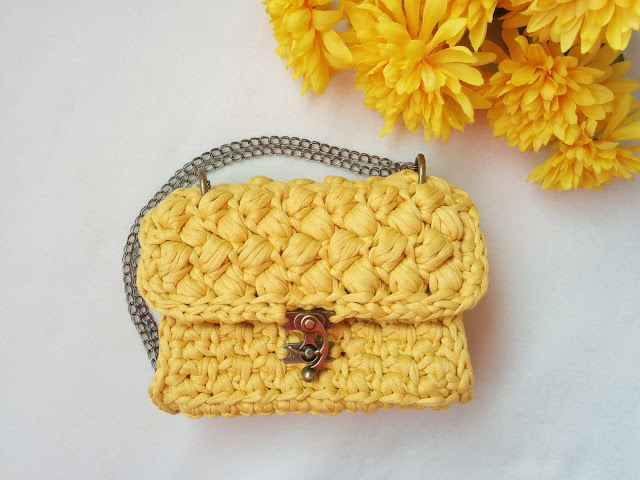 The Bucket Bag is easy to crochet ! 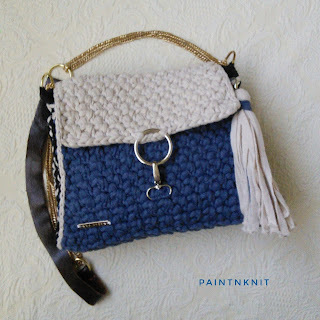 In this video, I show you how I styled my bag with tie ends and a tie on chain. Enjoy!